After leading dozens of night photography field trips, I have decided one of the most frustrating things to have happen is for someone to accidentally turn on a white light and ruin the dark adaptation of the whole group. The problem is some headlamps make you cycle through all the white light settings to get to the red LED. That is a terrible design for night photography. 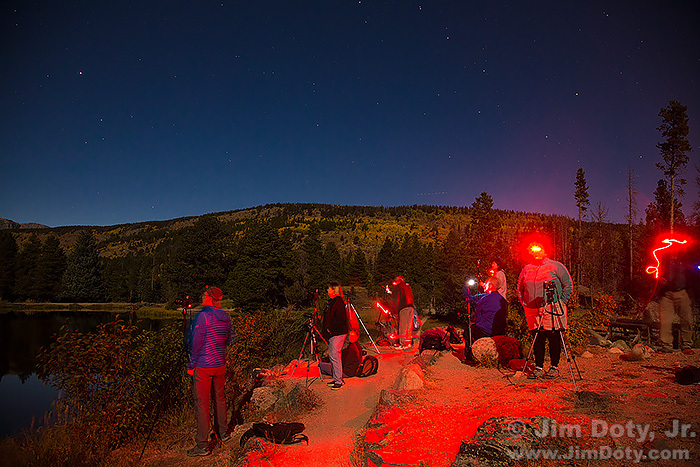 So the most essential feature for a night photography headlamp is a separate button to turn the red LED on and off. It is even better if the red LED button is separated from the white LED button. 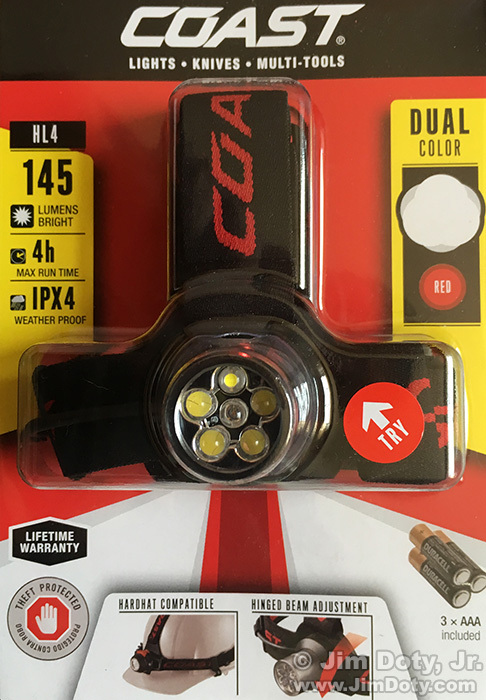 Coast headlamp purchased at Home Depot. 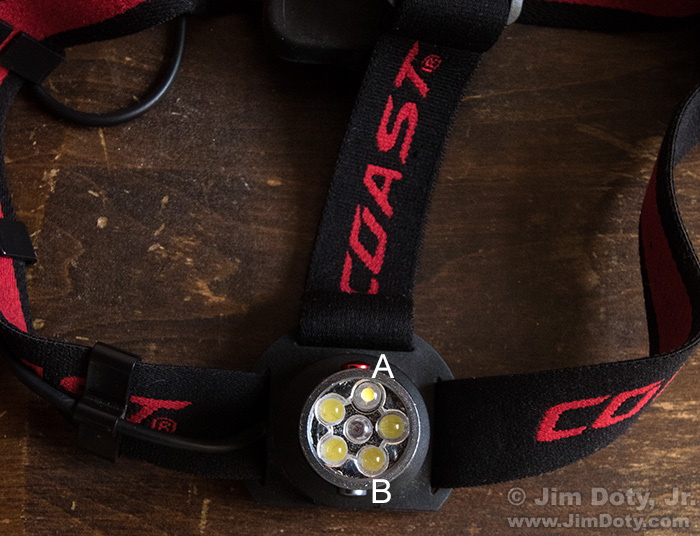 This is an inexpensive Coast brand headlamp that you can buy at Home Depot for about $21. It has the most essential feature. The model number is HL4 and the UPC on the back is 15286 19640. The red LED button (letter A) is on top of the LED light cluster and the chrome button that controls the white LEDs (letter B) is underneath the LED light cluster. This is about as ideal as you can get with the control buttons opposite each other. Once you have locked it into your motor memory that you always want to go for the button on top, you are all set. No accidents and no blinding yourself and nearby photographers. You can’t have your red LED on while you are actually taking pictures or the red glow will show up in the photos. So in a group workshop setting all red lights have to be off while shutters are open. On my workshops I will make sure everyone is all set to take their next picture before I say “going dark”. Everyone turns their headlamps off, and people say “shutter open” when they start their exposure and “shutter closed” when they are done. Once everyone has said “shutter closed” I say “going red” and we turn on our red LEDs and change our camera settings for the next image. When you go shopping for your night photography headlamp, look for the separate control buttons. If you can’t find this model at your local Home Depot (the replacement model does not have separate buttons for red and white) you can find it at the link below from one of Amazon’s third party sellers. Location Tip: If you are in Rocky Mountain National Park, Sprague Lake is a great spot to do night photography. The mountain range is distant enough that you can get stars in the sky and star reflections in the lake. Most people set up on the east side of the lake and shoot facing west. You can find the Coast Model HL4 145 headlamp in the Misc Goodies section of my photography store. This entry was posted in General, Photo Accessories, Photo Gear, Photo Locations, Techniques by Jim. Bookmark the permalink.